I came home from work today to a random power outage that lasted a solid 4 hours. The only thing that got me through my work day was knowing I could come home to drink some wine and get crafty... but craftiness is quite difficult in candle-light. Ok, so my point is... I'm posting this at 11:00 at night and that's why. At least I have power. 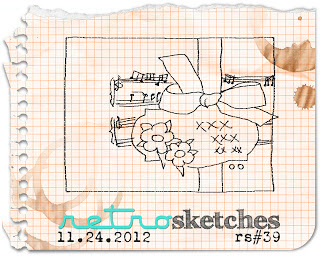 This Christmas card uses The Craft's Meow stamps, Recollections "Jingle Bells" stack, and Recollection washi tapes. Such a bright fun card...my favs!